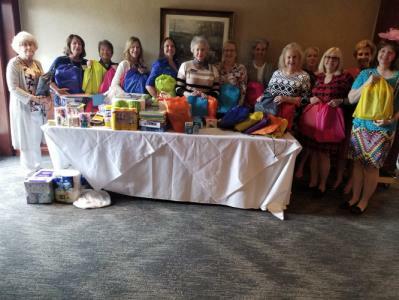 The Judge David Campbell Chapter, NSDAR, observed the DAR National Day of Service at their chapter meeting by collecting approximately $1,000 in student school and classroom supplies for the Kate Duncan Smith DAR School and for Mrs. Silvers’ Soddy Elementary first grade class. The Children of the American Revolution contributed to the supplies. Members of the chapter packed 50 drawstring bags of school supplies for Kate Duncan Smith middle and upper grade students and 25 bags of supplies for Soddy Elementary First Grade. 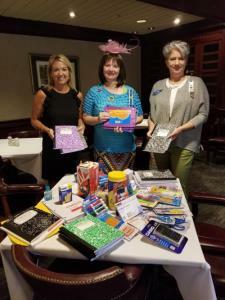 Chapter members Registrar Susan R. Thomas, Phyllis Carter, Linda Triplett, Sara Zimmerman and Second Vice Regent Marie Wingate delivered the filled drawstring bags and classroom supplies to the Kate Duncan Smith School in Grant, Al. They were greeted by Beth Cagle, development director and students from the school who unloaded the supplies. Chapter members attended the 94th Dedication Day program. Included in the program was presentation and dedication of gifts to the school from DAR organizations from all over the United States totaling over $707,410. Students from the 4th grade and the high school choir entertained the audience with their musical programs. After the dedication program, the school hosted a dinner on the grounds lunch for the over 100 DAR members and guests from all over the country who had attended the Dedication Day Ceremony. A walking tour of the grounds and the crafts fair were enjoyed by the chapter members.